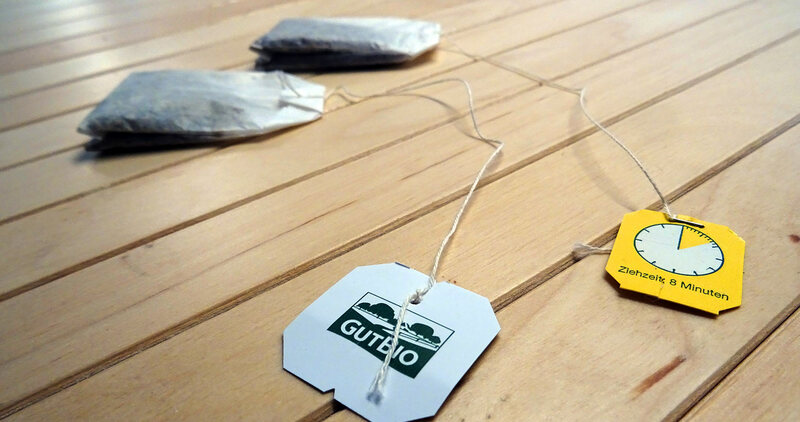 Coffee or Tea when Sailing? It´s an undeniable fact that human beings need liquid to stay alive. Some say, it´s up to 1.5 litres of water per day. Well, I personally never reach this amount of beverage during 24 hours but I know of the importance of drinking – especially during sailing. Have you experienced a lack of nutrition during a sailing trip by your own? You easily forget to eat and to drink when helming which can have serious implications in the aftermath: Malnutrition, Hypoglycaemia and liquid deficiency can cause painful headache, loss of concentration, a bad mood at least and if kept over days even more serious consequences. On the other hand, drinking whilst sailing (and of course I am talking of non-alcoholic beverages here, drinking beer and alike after dropping the lines is a strict no-go!) can be pure treat. And I am not solely meaning when getting up and having a solid, full-fledged breakfast, but also in between, maybe during the dog´s watch out at 2 a.m. in the pitchblack darkness, having a superhot steaming cup of sweet something is like heaven. It will warm you from the inside and help you to forget your wet cold freezing toes. At least for some minutes. But: What would it be? A coffee or a tea? Let´s begin with coffee. This precious roasted dark brown powder that makes literally the whole world go ´round. That´s something no yacht´s galley should ever run short of. We´ve tried two ways of preparing the shots. Besides, a third way, the aluminium capsules, is from my point of view an absolute no-go as well. 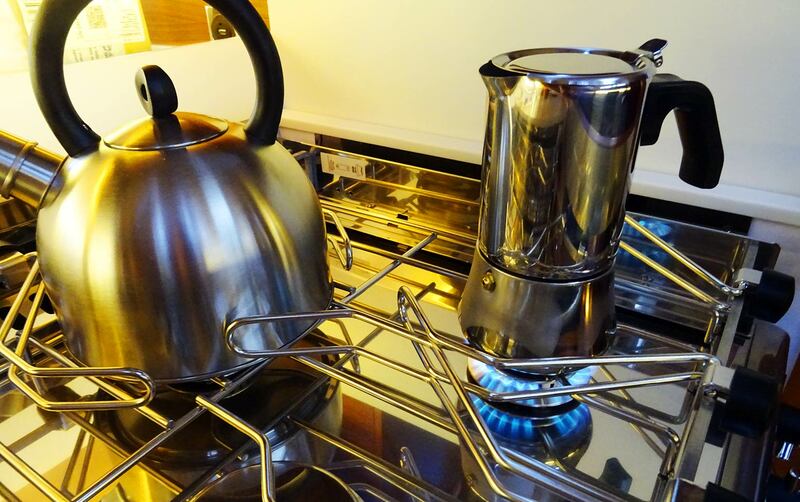 When preparing breakfast or getting ready for a long haul sailing session, the most convenient way to have your coffee made is by letting hot water dripping through a filter right into the thermos flask. Fast, no-brainer. Just add boiling water, that´s it. Even making individual cups when underway – even in hard wave action – is possible when executed professionally. The downside: The taste is … well … average at best. 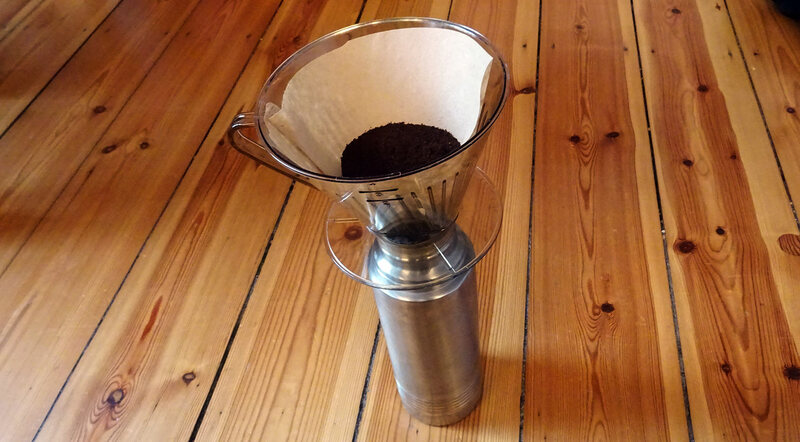 As a coffee connoisseur I am maybe the hugest fan of the good old fashioned Bialetti-style of brewing a coffee. Of course we go for the stainless steel coffee-maker as we do not want to push the risk for Alzheimer´s disease here with Aluminium-coffee makers. I would say, preparing a coffee like that is the best and most tasteful way for a hot and fresh coffee. The best thing is, you do not even have to have Espresso powder, the coffee will taste as fine if you take ordinary powder as done for the dripping version. Nevertheless, this way of making your coffee is a tedious one since the coffee makers are limited in their coffee making capabilities: 8 cups of espresso for the bigger makers is … an average mug for the sailor. In reality, I use both on my yacht: The Bialetti for the one really important coffee of the day: The first one. The dripping version for preparing bigger quantities all day long. 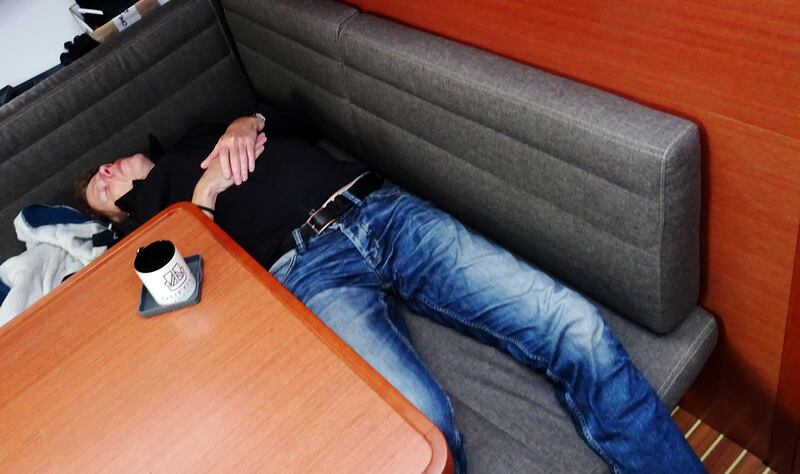 Oh boy, I was so through … when seasickness had me, I was so down I couldn´t even have coffee. And this was exactly the same side effect the Skipper had as well. We´ve had no hunger for the once beloved black liquid. Worse, the pure thinking of having a coffee made my stomach turn around and corded up my throat. Crazy, isn´t it? Even more crazy: Both the Skipper and myself felt a sudden craving for tea. For Peppermint tea, to b exact. Why was that? Maybe this is the old human´s believe in the soft healing powers of herbs. Maybe it´s the sweetness of the tea that gives back some sugar-based energy to the hard battered body suffering from all the puking? I don´t know, but tea for sure has its own mystical powers. Left: Good. Right: Not good! But do me one favour. No, two favours: First is to please check how the herb containing bags are attached to the small thread. Is it done by a cord or knot – or did they use a small metal cramp? If so, please refrain from using these tea bags. Also, second, never-ever throw the used bags into the sea, even if there´s no metal attached to the bags. Suffocation hazard is high and you don´t want to add to the pollution of our Oceans. I must admit I am no fan of thermos jugs. Why? Because I just love it to suddenly ask: “Anyone in for a cup of tea?” The sudden shine in the eyes of the freezing crewmen, the joy and every time this excitement and surprise, it works so well that you can do it twice in one watch and you´ll always earn this beautiful, thankful glance of your watchmate. It´s so easy as well: Just add hot water, pour it directly to the mug, that´s it. But, especially when foul weather arrives and you know you won´t be able to fire up the stove for hours, keeping it hot becomes crucial. Keeping it warm. At least for some time. 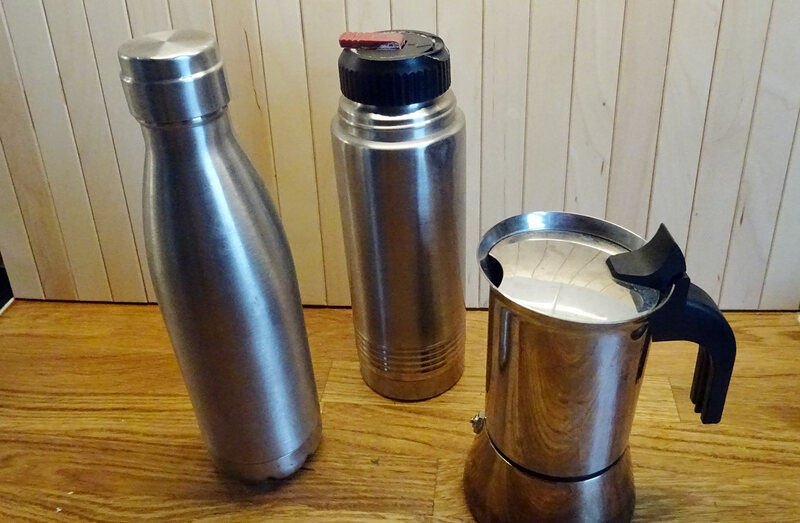 My experience with thermos flasks is this: No matter how much money you spend on them, no matter what you´ll try, the contents will surely lose temperature over time so that after some hours the once boiling hot water will be hand-warm at best. What was once a warming hot tea will become tepid and the fresh hot coffee – worst of them all! – will taste like the socks of my elder brother once used to smell when he arrived home after a day of soccer … I simply don´t like thermos flasks. But I guess, there´s no choice. One rule should be followed anyhow: Never put coffee into a tea flask and the other way round! So in the end, what do you prefer? Coffee or Tea? It´s a question of everyone´s taste and mood for sure. I´m having both of them in my galley, Espresso and dripping coffee powder, even instant coffee (yes, there are sailors how simply love the grainy freeze-dried stuff), tea of different tastes, sugar, artificial sweetener (in case my parents arrive at the jetty) and for longer trips: Fresh Ginger and Honey, which is the best tea if you ask me. No matter which one you prefer, may you just enjoy your hot stuff to celebrate the first sunbeams on a chilly morning, have a thorough breakfast with your crew after landing in a new harbour or during a cold midnight watch. Just … enjoy. Nice memories: The transfer trip of my own sailing yacht.